You can find the rosters and results from the showcase by clicking here. The following are a few observations on the standout performers. Natalia Leguizamon, 5-6, SG, Class of 2019, West Allis Hale -- Leguizamon has good range on her three-point shot and also showed the ability to score in traffic. She averaged 8 points per game for coach George Sotiros and the Huskies, who went 21-4 and captured a share of the Greater Metro title last season. Madison Lindauer, 5-10, PG, Class of 2019, Tomah -- Lindauer is a lefty point guard that shoots the ball well from the perimeter and can find the open player. She also has quick hands which helps her get deflections and steals on the defensive end of the floor. Last season as a junior, she averaged 18.7 points, 5 rebounds, 3 assists and 4 steals per contest for coach Mark Von Haden and the Timberwolves. Isabel Majewski, 5-10, G, Class of 2019, Pulaski -- She is a long guard that can get to the hoop and also connect from behind the arc. Isabel averaged 11 points and 5 rebounds per game for coach Jeff Charney and the Red Raiders as a junior, and is expected to move into a larger role this season. Kaylee Meyers, 5-8, PG, Class of 2019, Darlington -- Lefty point guard that sees the floor well and can score off the bounce and shoots well from behind the arc. Kaylee led to team to an undefeated record at the showcase and was a leader whether she was on the court or watching from the bench. She averaged 17.8 points per game last season for coach Kelly Rose and the Redbirds, who went 19-5 last season. Abigail Stevens, 5-9, W/G, Class of 2019, West Allis Hale -- Stevens is lefty wing that does a little bit of everything. Abi and teammate Natalia Leguizamon will move into leading roles for coach Sotiros and the Huskies this upcoming season. Abi averaged nearly 9 points and 6 rebounds per game as a junior. CaSandra Warmsley, 5-9, W/F, Class of 2019, Slinger -- Athletic wing that is disruptive on the defensive end of the floor. Good off the dribble and can score from perimeter. Averaged 8 points per game for coach Tony Dobson and the Owls, who went 20-4 overall last season. Jaelyn Acker, 5-6, G, Class of 2021, Germantown -- Acker gets after it on both ends of the floor. She can knock down the three-pointer and has good handles. In her freshman season, she averaged 8 points per game for coach Matt Stuve and the Warhawks. Clare Diener, 5-9, SG, Class of 2022, Cedarburg -- Diener, daughter of longtime high school basketball coach Tom Diener, has a smooth shot from behind the arc and won the 3-point contest at the showcase. Good upside as she continues to improve on other facets of the game. Kate Hosking, 5-9, SG, Class of 2021, Slinger -- Hosking plays with a high motor and has the ability to score at all three levels. Sara Kasar, 5-6, G, Class of 2021, Oak Creek -- Kasar played with confidence and leadership on Sunday. She has good handles and can knock down the three. The Knights graduated 10 seniors from last year's team, Kasar will be among the roload group of newcomers for coach Steve Hluchnik's squad. 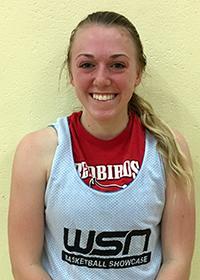 Isabella Lenz, 5-9, SG, Class of 2021, Prescott -- Lenz had a breakout freshman campaign, averaging over 15 points and nearly 5 assists per game for coach Ron Murphy and the Cardinals. She showcased her play from the perimeter on Sunday.